A poetic mood unifies this composition. The hazy landscape echoes the woman’s emotional state. She seems lost in reverie. Her deep-set eyes and dropped shoulders evoke pathos. Is she playing her mandolin? Or is she pining about the suitor who played for her? Corot’s long-delayed success came in the 1860s, with lyrical landscapes like the one in this painting. They display the directness and spontaneity of Impressionism. But the older Corot poeticized nature, generally painting idealized landscapes, with historical, biblical or mythological figures. Corot was both a forerunner of Impressionism and the last representative of a tradition of idealized, historical French landscape that stretches back to the 17th century. 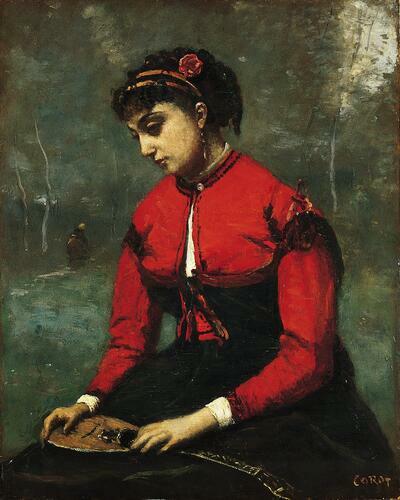 Corot painted this late work when he was in his early seventies. It remained in his own collection until his death in 1875. The meaning of the title—one of the earliest to be attached to the painting—may refer to the thinly painted element sitting atop the figure’s left shoulder.